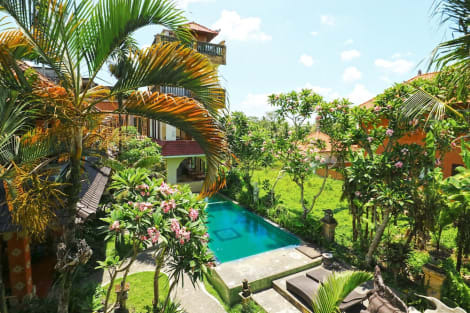 With a stay at Villa Pecatu Ubud in Ubud (Pengosekan), you'll be within a 10-minute drive of Ubud Monkey Forest and Ubud Traditional Art Market. This villa is 11.7 mi (18.9 km) from Sanur Beach and 1.4 mi (2.2 km) from Ubud Royal Palace. Make yourself at home in one of the 101 air-conditioned rooms featuring minibars. Rooms have private balconies. Complimentary wireless Internet access keeps you connected, and cable programming is available for your entertainment. Private bathrooms have complimentary toiletries and slippers. Located in Ubud, Labak River Hotel is within a 15-minute drive of Ubud Monkey Forest and Ubud Traditional Art Market. This hotel is 11.6 mi (18.7 km) from Sanur Beach and 2.4 mi (3.8 km) from Ubud Royal Palace. Make yourself at home in one of the 35 air-conditioned rooms featuring minibars and LCD televisions. Complimentary wireless Internet access keeps you connected, and satellite programming is available for your entertainment. Bathrooms have complimentary toiletries and hair dryers. Conveniences include safes and coffee/tea makers, and housekeeping is provided daily.